Breakfast tacos are a decidedly Texan way to start the day. My Mom makes the best potato, bacon and egg breakfast tacos with roasted tomato salsa on the side for dipping. As I was devouring her spicy tacos the other morning before catching my flight home, I started to think about how delicious a sweet breakfast taco would be. The banana Nutella taco was born. It was pretty tasty on its own, but I decided to roll it up into a burrito and deep fry it. Deep fried burritos, also known as chimichangas, are a Tex-Mex creation that are typically filled with savory ingredients. 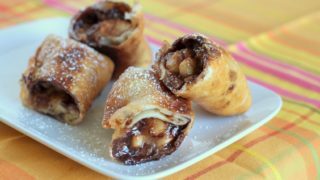 These sweet and crispy chimichangas are great for breakfast, but just remember to wipe the Nutella off your chin before heading out for the day. In a 9" cast iron skillet, heat the canola oil to 350°. While the oil is heating, warm the tortillas in the microwave or oven. Dice the banana and mix it with the cinnamon, cayenne pepper and hazelnuts. Once the oil has reached the right temperature, spread each tortilla with 1 tablespoon of Nutella in the center, in about a 4" x 3" rectangle. Add the spiced banana mixture in a small clump on top of the Nutella, almost in the center of the tortilla but more towards one side than the other. Take the side of the tortilla with the bananas closer to the edge and begin rolling up the tortilla, tucking in the sides as you go so that all ingredients are completely enclosed. Secure with 2 or 3 toothpicks. Drop them carefully into the hot oil and fry for about 1 minute on each side. Keep in mind that because you are using a cast iron skillet to fry, the side of the tortilla touching the pan will brown quickly. Once the chimichangas are golden brown and crispy, remove them from the oil and let them drain on a paper towel before eating. These look like a dangerous way to start the day! How could they be bad?! OH MY! This is sinful. But they look delicious…can’t wait to try ’em! Oh no you didn’t… But wait, you did… How can I repay you for such an awesome idea??? Cannot wait to spring these on folks for dessert after our next big Tex-Mex feast! My word these look like the bees knees! Of course I love anything fried and obviously banana & Nutella, but wrapped in a tortilla, that was such a great idea. Wow, these look delicious! Banana and Nutella are my kind of dessert. Hello, dessert chimichangas. Where have you been all my life? These look incredible. So jealous that breakfast tacos are what home is like for you! I wish your Mom could make me some, I’m sure they’re amazing! 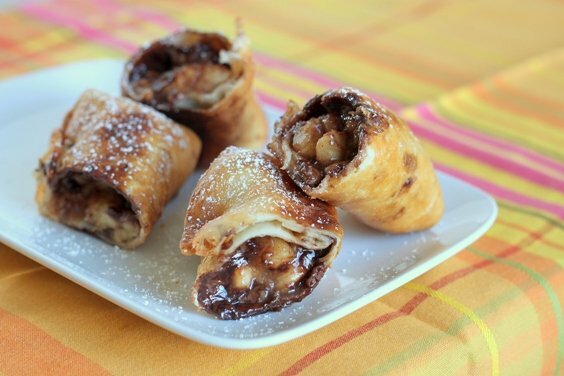 I love this idea…sweet, crunchy, nutella-y. I’m there! Oh man, these look a little too good. Damn you, now I want a breakfast taco! We had something similar to these at Max Brenner’s Chocolate by the Bald Man, a restaurant in NYC. It’s a chocolate EXPERIENCE. They did banana and sea salt caramel egg rolls with chocolate dipping sauce. I love your idea of a sweet breakfast taco though. I’m imagining other crepe style fillings, like nutella and strawberry, or whipped cream and a raspberry, strawberry and blueberry mix. I think it would work. YUM! I think I just fell over!! Just Looking at these is totally ruining my big diet plan scheme, oh my gosh! And you are a Czech girl after my own heart haha I am totally a red cabbage fiend!! And Kolaches, Hello!! My all time Favorite pastry. Blueberry ones especially :) Do you have a recipe to share? I’m workin’ on kolaches for 2! How many kolaches can you eat? I can eat 4, so my recipe should make 8? I can’t decide on an appropriate serving size! Isnt 8 one serving? Lol. My hubby would LOVE this!!! He is a HUGE nutella fan! Oh, I’m going to need help. I’m on a nutella kick right now. This looks freakin’ fantastic. Bookmarked! oh my goodness! this is what i want for breakfast right now:) absolutely delicious! thank you for sharing your creativity. have a great day. I’ve never tried or heard of breakfast tacos but they sound delicious especially with the nuttella and bananas! I can’t believe I haven’t tried that combination before! Yum! Great looking dessert chimichangas. OMG! those look to die for! OMG!! wow girl…I adore chimichangas, but a sweet version…oh I’m in love!! O wow! These look amazing! Holy yum!! I’ve just come across your blog and am definitely bookmarking this recipe. These are gorgeous. I just made these and am eating them now! Pretty delicious. I had never fried anything before, though it seemed like that was waaay too much grease. Less would have amply covered the chimichangas. I don’t get up early enough to make breakfast, and I’m also pretty sure that I’d burn my arm off if I tried to fry before Noon, but this is definitely a great snack! Ok, I thought there was nothing better than a banana nutella crepe, but I was wrong. So wrong. Oh. My. God. These were delicious! So easy to make, and soooooo delicious. This was perfect for a friend who can only tolerate a little egg and a little dairy. Thanks for the recipe! These sound AMAZING! I am loving going through your recipe index. So many delicious treats! I’m going to prepare them immediately!!!! !